Order Sesame Street Old School Volume 2 and save more than 30% off the regular price. 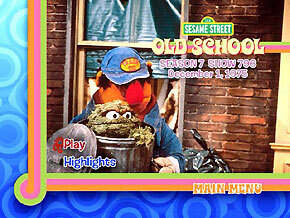 Sesame Street Old School Volume 1 is also available. 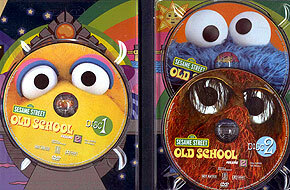 Greg Brobeck (November 1, 2007) - It's hard to outdo last year's awesome Sesame Street Old School Volume 1 set, but Old School Volume 2 does in a big way. This "best of" collection picks up where volume 1 left off with material covering the years 1974 to 1979. This was a very good era for the series. The show had hit its stride, the adult cast had gelled, the Muppet performers had grown and the show became even more lovable. This collection is intended for adult collectors, the ones that grew up with old school Sesame Street and love its virtues, entertainment and memories. Included are the season premieres from the sixth through tenth seasons, as well as the first test show, 57 bonus sketches and songs and a few hidden extras. The 70's was the era of disco and leisure suits. 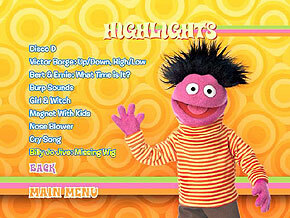 Always one to jump on board with current fads, Sesame Street joined the disco era as well. This was when Pinball Number Count by the Pointer Sisters debuted on the street. The designers of the box art went all out with graphics from these animations. 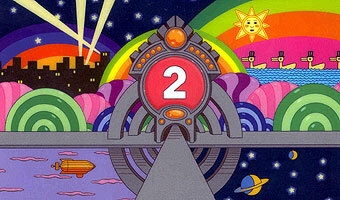 In addition to a few cast photos, graphics from Pinball Number Count #2 are highlighted inside the package. It's quite nice and fits the era. Consider it flashy without being too flashy. The set also comes with a replica animation cell from Pinball Number Count #2 and a 10-page booklet describing the episodes and show's evolution from 1974 to 1979. 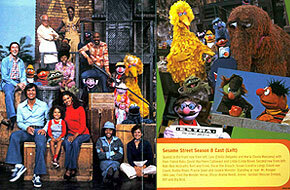 The 10-page booklet on 1970's Sesame. Three DVD's are included in the box set. The menus are nearly identical to those of the first set. Each main menu screen has a television set with a classic clip from a show on that disc playing on it. Next to that you can choose either an episode or "Bonus Features". Episode menus feature a still from that show, its airdate and episode number. You can either go to a list of highlights or play the episode from the beginning. The main menu for episode 796. Episode introductions are much better this time around. Instead of the animated Bob character, the Typewriter Guy comes on screen, as in his much beloved sketches. 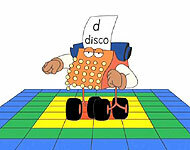 He types a letter and then a word relating to the late 70's (such as D-Disco). These new introductions are very creative and a lot more interesting than the ones with Bob from the first set. Initially, there doesn't seem to be many edits in the five season premieres (at least going by what aired on Noggin in the late 1990’s). However, there is one edit in show 796 (the 7th season premiere) that is a little odd. In a touching little street scene, Maria gets a typewriter from Luis for David's birthday. She then surprises David at Hooper's Store, gives it to him and sings only the words "Happy birthday to you." Then they share a brief kiss. It’s one of those kisses where you kiss each other on the cheek at the same time. This scene is intact on the DVD up until we get to the kiss. Then it fades to black without the kiss. Since "Happy Birthday" has exorbitant licensing rights it's possible this is the reason for the edit (even though Noggin aired this scene uncut on television). Hopefully the cut wasn't because someone at Sesame Workshop or Genius Entertainment is intentionally shunning interracial relationships. It could be argued that children will think Maria is cheating on Luis (who she would marry nearly 15 years later) but that theory doesn't apply as much to a set aimed at adults. 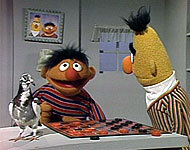 Similar scenes with David and Maria are also seen in the classic 1978 special Christmas Eve on Sesame Street which is currently available on DVD. There is also a sketch that's been cut in episode 666. The "Dialing For Prizes" game show sketch has been replaced with another classic Guy Smiley moment, "Beat the Time" starring loveable, furry pal Grover. For the most part, the quality on this set blew me away. I didn't think it could get much better than last year's volume, but I was wrong. The video quality on the episodes and the bonus sketches is amazing. The picture is sharp and the colors are vibrant. Characters seem to leap off the screen. The audio is also very good. The only quality gripe I have is with the bonus test show. The video is grainy and murky and there is a lot of video noise throughout. I have had the opportunity to see an unedited copy of this show and the video quality was a lot better. 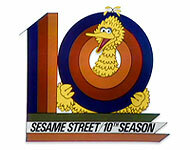 It seems Sesame Workshop could have used a better-looking copy of this extreme rarity since it does exist somewhere. ORIGINAL TEST PILOT - This is the first full episode of Sesame Street ever produced, but it never aired to a national audience. 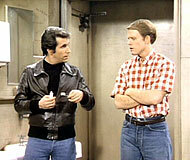 In the summer of 1969, a full week of test episodes played on a translator of NET station WHYY in Philadelphia, Pennsylvania four months before the program debuted. A group of children were tested before and after each episode to gauge their reactions and if they learned anything. 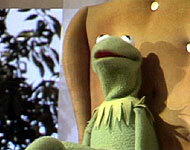 Producers had decided that a clear line between fantasy and reality needed to be drawn, and the way to do that was to prohibit adults from interacting with Muppets. Kids enjoyed the animations, films, and especially the Muppet segments, but during the street scenes with the adults, interest dipped. Children's minds wandered, and attention spans dropped. 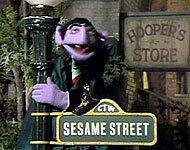 CTW made the necessary adjustments by adding Muppets to the street segments. It's really fascinating to see this early effort and to see what went wrong. 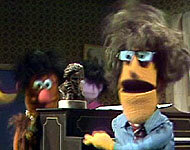 An unidentified actor is in the role of Gordon here, and he doesn't seem to connect with the kids or the audience. 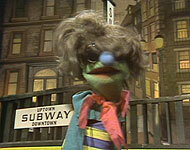 (Matt Robinson would replace him as Gordon by the time the show debuted in November 1969.) The final segment, "The Man from Alphabet" did not catch on with kids at all and I can see why. The sketch's over the top humor not only kept it from being understood by kids, but kept it from being educational as well. Unfortunately, the first test show has also been edited. 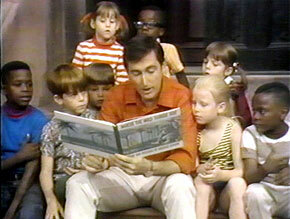 One fascinating scene in the show as it was originally produced featured Bob reading the book "Where the Wild Things Are" to a group of kids. This story has been entirely removed, likely due to rights issues with either Maurice Sendak or the book's publisher. The corresponding plug for the book at the end of the show has also been edited out. In any case, the edits of David and Maria's kiss and this story are considerably less than the cuts made on Old School Volume 1. BONUS SKETCHES - 57 classic clips are included here which is a few more than were on last year's set. Not only do we get to see old favorites, but ones that might not be so familiar that are just as much fun to watch. More closing credit sequences are also included. Don Music writes "Mary Had a Bicycle"
Buffy Sainte-Marie: "Wynkin Blynkin & Nod"
Animation: A little girl plans what she's going to wear in the snow tomorrow. Overall I was quite impressed with this set. 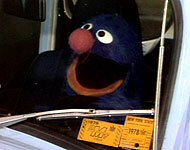 The middle to late seventies is one of Sesame Street's greatest eras. 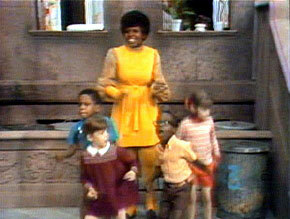 With famous tunes like "What's the Name of That Song" and beloved characters like Don Music, the good times are non-stop. While the set recommends adults that it might not suit today's preschoolers, I think it's fun for everyone in the family. I'm really thankful that the edits were minimal and hopefully we'll have more Sesame Street Old School volumes for years to come. I cannot urge you enough to buy Old School Volume 2 for yourself. As always, sales are the best way to encourage that more Old School volumes are released. 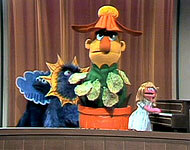 You can listen to the music of Sesame Street Old School twenty-four hours a day on Muppet Central Radio. For fans who are familiar with the Noggin versions, the following sketches were removed from these episodes when they were broadcast on Noggin. (The network cut about four-five minutes from each episode.) Thankfully, they are included on the DVD's in their respective episodes.